Janice leads digital at a well-known tech company in Silicon Valley. It sells hardware such as phones, laptops, and servers to largely premium B2C and B2B consumers. The brand gave Janice one marketing objective – use content to drive leads to the sales teams. She instructs her team to create a gated white paper. About 500 people completed the lead-gen form to receive the download. The sales team hits the phone. Out of 500 leads, only four were genuine. Those results should have been expected because most people who downloaded the content were never really leads. They didn’t want a call from the sales team. They wanted valuable content. They “bought” the content with their phone number. The audience’s intent was informational. Unfortunately, the marketing team viewed the white paper’s purpose as transactional. The misalignment of intent led to disastrous results. Informational intent – Audience members consume content as part of their research or their interests. Transactional intent – Audience members act with the purpose of completing a transaction. 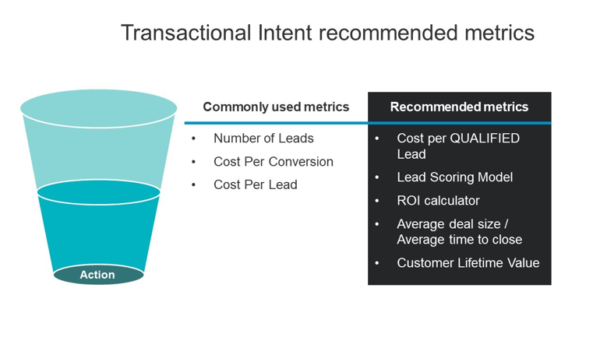 This graphic suggests how the two types of intent work when placed within the sales funnel. Content that caters to audiences with informational intent is designed to help, educate, inform, teach, and entertain. Informational content works better when you create it through the lens of audience, not the brand. It is content that convinces, not content that converts – yet. You should not attach conversion expectations to its performance. 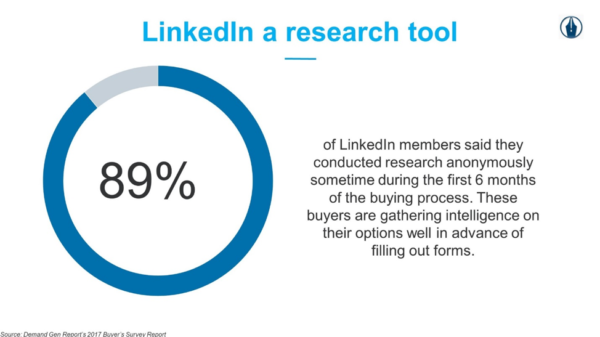 On LinkedIn, about 89% of our members use our platform as a research tool before they make a purchasing decision. I believe this is reflective of all social media platforms, which means about 89% of all content a marketer produces for digital should be aimed at satisfying the audience’s informational intent. This content is what really drives the best customer experiences with your brand on social media and should be designed to assist audience members in increasing their understanding of a topic, your brand, or an industry. 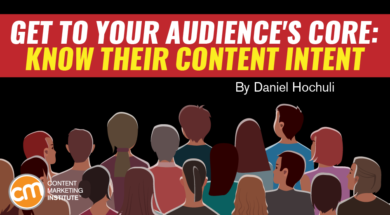 The format for informational-intent content should depend on what you know about how your audience prefers to consume content and the distribution channel. It could be a blog post, a video, a webinar, a white paper, an infographic, or a display ad. As mentioned, this type of content should not be expected to convert into leads. It is meant to help audience members become more informed so they make a more informed purchasing decision when they are ready to convert. The calls to action here include sign-ups, subscribes, video plays and completes, and any metrics that help you articulate a growth in engagement, followers, awareness, and sentiment. Content with transactional intent works best when the audience has been convinced and is ready to convert. The content is more advertorial. It is all about how great you are and should showcase product and services at its core. It is content that reinforces that what you are selling is the solution the audience is looking for. You want to do your best to encourage the audience to take a transactional-related action after consuming the content. All that said, it is important to understand that only about 10% of your addressable audience is at this low stage in the sales funnel. This follows the Pareto principle – a small segment of your audience drives most of your results. When it comes to measuring the effectiveness of content with transactional intent, you could use lead-generation forms, event registrations, e-commerce buy-now objectives, etc. Use this content to calculate a return on investment (ROI) because it is directly tasked with creating customer opportunities. If the ratio is 89% informational intent to 10% transactional intent, how can you change the audience’s intent from informational to transactional? The truth is, you largely can’t. Audience members decide when the time is right for them to convert. They have different journeys and often are affected by forces outside of your content. This is especially true in B2B and premium B2C audiences. When we think, for example, what needs to be done to convince Steve, head of IT at a financial services firm, to adopt laptop solutions from Janice’s brand, we tell ourselves (and our stakeholders) that content will be a huge, if not deciding, factor for Steve. Truth is, the offline considerations Steve needs to overcome have more of an impact on his decision-making process than any content Janice’s team can produce. It’s possible Steve was convinced six months ago that Janice’s laptops were the solution he needed (largely convinced by the content the brand produced). However, he didn’t have the budget or the stakeholder buy-in to make the purchase. He’s waiting for the ducks to align offline before he can convert online. What should Janice do? The catch is that Janice doesn’t know what content is most relevant to Steve because she doesn’t know what he is thinking and doing. You cannot predict when and how a customer requires informational-intent and/or transactional-intent content. All you can do is be there with relevant transactional-intent content when this shift occurs. In content marketing, we call this tactic “always on.” The idea is that you are always there when the customers themselves decide to convert. 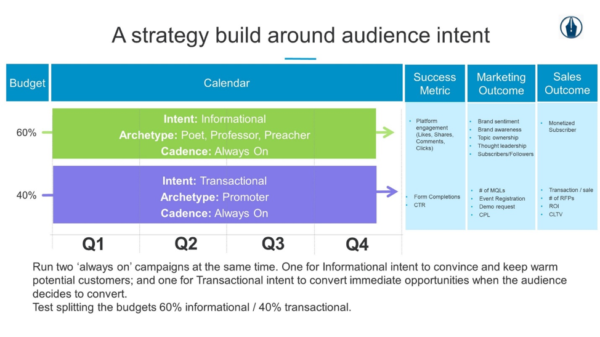 Below is a generic distribution plan of how a brand could approach being always-on with informational intent and transactional intent. The trick is to run the two campaigns simultaneously: one always-on campaign for those who need to be convinced or kept warm with more information or whose circumstances are not aligned to convert now, and one always-on campaign for those who are ready to convert. Remember though, the transactional-intent content, while it converts, is just a conduit to the transaction. A mere doorway. It is rarely a driver. The convincing should happen with all the always-on, informational-intent content you served throughout the customer journey. In the green section is the always-on, informational-intent content nurturing, informing, and keeping potential leads warm. In the purple section is the always-on, transactional-intent content converting and promoting those whose circumstances are aligned to make a transactional action now. One builds momentum for future conversion opportunities, the other captures immediate opportunities as they come to light. Most of a buyer journey (particularly in B2B and high-end B2C) is spent building trust and convincing rather than converting. 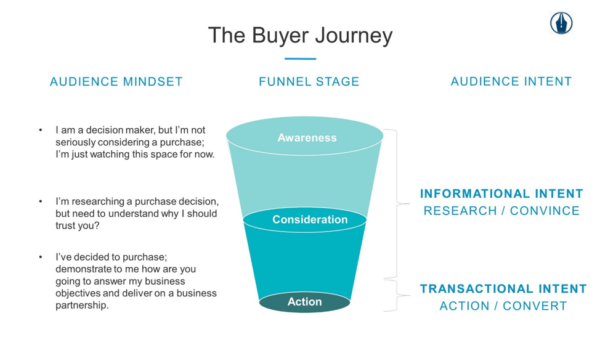 Informational intent takes up around two-thirds of the average buyer journey in the funnel. Informational intent is what most people have when they consume most content. Consider the target audience and its intent. Are you building content around informational or transactional intent? Consider the objective. What metrics are going to help us correlate the intent to the objective? Consider the content type. For example, if the intent is transactional, does the audience convert better with a case study or a product demonstration? Consider the content format. If you are distributing on LinkedIn, will a white paper or a video be more engaging for the target audience? Never start with the format or channel, start with the audience and its intent and objective. This will help you identify in which channel and in what format you need the content to be located. 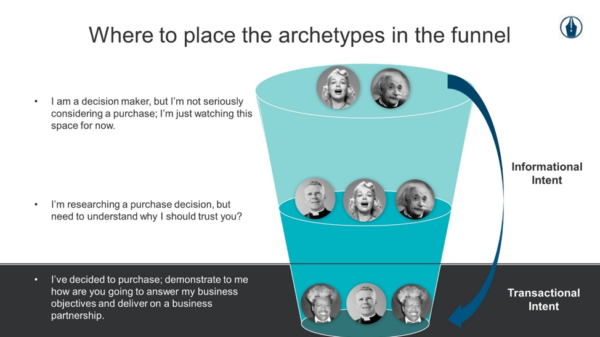 Realistically, only one of the archetypes (promoter) caters to transactional intent and it would make sense that you should weight your content creation in the same way. Make one-quarter of your content bottom funnel and therefore accountable to direct lead generation and an ROI accountability. This is clearly a scary proposition, especially for marketers whose department and performance metrics are oriented toward product or sales and not toward the customer, but it is important to be realistic about how many people are there to buy from digital channels like social media and display. Ask yourself, when was the last time you bought something on Twitter or Instagram? If the answer is never, then welcome to the majority. Information consumption is the normal behavior on digital. It is not because you cannot or won’t buy on such digital channels, it is simply because your intent on those channels is not transactional. You want content, not product. Unfortunately, audiences on digital are bombarded by last-click, transactional-intent content no matter where they are in the funnel. Brands and marketing departments have not understood properly how their target audience uses digital nor have they aligned performance metrics to the normal engagement actions the audience completes online. 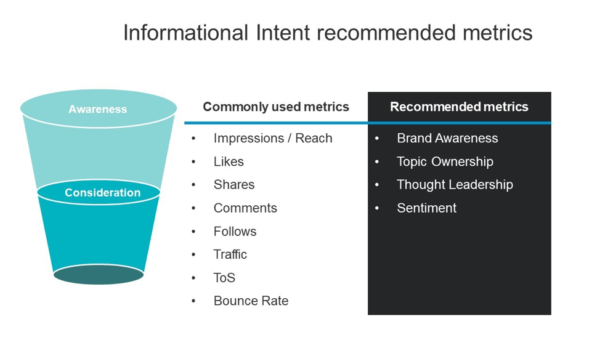 Understanding intent helps you create more relevant content and more realistic performance expectations. Imagine if you gear your marketing toward the intent of your audience. You stop shouting at audience members to buy your products. You stop asking for a conversion on every video. You stop gating your white papers with the intent to send an army of sales people after them. You stop turning your social media feed into a glorified product catalog. You stop interrupting the information audience members want with pre-roll and mid-roll ads. What if you gave them the value and the information they needed, no questions asked? What if you became the brand with just the answers, not the brand with just the pitches? Wouldn’t that be a better digital experience for everyone? 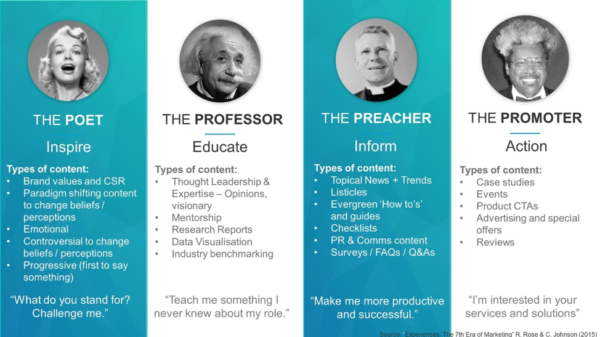 Want to consume tons of informational-intent content to expand your content marketing knowledge? Enroll in the spring semester of Content Marketing University, an online, at-your-own-pace experience.